Publisher 1. Gale & Polden Ltd.
2. Naval & Military Press Ltd. The Border Regiment in the Great War provides you with an in-depth and uniquely composed view of the Regiment. Colonel H. C. Wylly brings together a diverse and seemingly impossible collection of detailed histories divided into 14 chapters covering the opening of the War to the final advances that would see in a victorious end to such a bitter conflict. Each chapter is sub-divided in battalions, for instance, chapter 4 (1915) contains the 1st and 6th Battalions in Gallipoli and the 2nd, 5th, 7th, 8th, 9th and 11th Battalions in France, each describing their actions during specific battles. The book also contains appendices, illustrations and maps (all in b/w) and a preface written by Major-General E.G. Sinclair-MacLagan, the Commanding Officer of the Border Regiment in 1924. 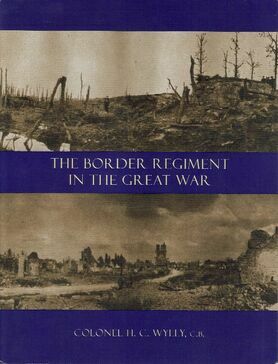 This volume contains the history of the Regimental Depot and the thirteen Battalions into which "The Border Regiment" was expanded during the Great War of 1914 – 1918. Our warmest thanks are due to the author, Colonel H.C. Wylly, C.B., for the skillful manner in which he has recorded the doings of the different Battalions in six separate theatres of war, and has merged them into one consecutive narrative – a task which at first sight appeared well nigh impossible. Before commencing the work it was considered whether better results could not be obtained by keeping the history of each Battalion throughout the war separate; but the idea was discarded, not only on account of the repetition which such an arrangement would have involved, but chiefly in order to bring out the important fact that The Border Regiment, both in peace and war, exists not as a collection of separate units, but as one large united family irrespective of the number of Battalions embodied in it. The two Regular and and two Territorial Army Battalions and the Regimental Depot are the permanent portions of the Regiment which exists to-day to bear the honours won by their comrades in the Service Battalions, now disbanded, and it is hoped that the personnel of those Service Battalions will always regard the existing four Battalions and the Depot as their living representatives. The History of The Border Regiment has been compiled with a triple purpose in view. Firstly, as a personal souvenir for those who fought with the Regiment to enable them to recall to mind the part which they and their comrades played in assisting to bring about a great victory. Secondly, for the information of past members of the Regiment and the people of the counties of Cumberland and Westmorland. Thirdly, for those who come after, in the hope that it will help to foster throughout the Regiment that feeling of esprit de corps on which the efficiency of our army so greatly depends. Our thanks are also due to those officers who have prepared the sketch maps; to Lieut-Colonel H.W. Grubb, C.M.G., D.S.O., and the members of the Regimental Committee for their work in connection with the preparation of this History; and to Mr. C.S. Seager, director of the publishers, for his valuable advice and assistance at all times so readily given. This page was last edited on 15 February 2017, at 20:10.